GreenRoad Central is the hub for your entire fleet performance management program. Our easy-to read charts help you quickly get visibility into your entire fleet, from the broad trends down to the details of individual fleet driver and vehicle trips. With just a few clicks, you can access an overview of fleet safety and fleet fuel consumption trends, including driver and vehicle safety scores, risky driving behaviors demonstrated by a large number of drivers, distribution charts, and more. Make faster, better decisions with real-time visibility of your vehicles and drivers locations and statuses, as well as traffic conditions that might impact scheduled trips and tasks. Our fleet resource locator also gives you a filterable, real-time view of your entire fleet to make more informed dispatch decisions and improve service and customer satisfaction. Risky driving and excessive idling can both cost fleet-based companies a great deal of money. 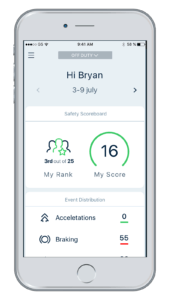 Our dashboard helps you identify times and places where your fleet is more likely to experience safety or idling events so you can set routes and policies that mitigate these problems. 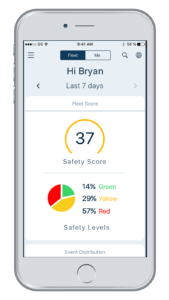 Quickly see all your driver, fleet, and organizational safety KPIs and scores with our easy-to-read charts. At the same time, instantly track your progress toward better fuel efficiency with fleet fuel usage and idling KPI charts. 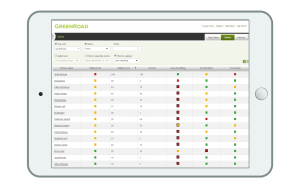 GreenRoad provides a streamlined way to add fleet vehicles, users, and other organizational information, set up geo-fencing, see fuel card reporting, generate vehicle health reports, set up company policies for speeding and idling thresholds, and more.